Sample Blog Post 2 - Headline | Brawer Hirsch & Associates P.A. Last week the FBI officially warned news organizations that it has received “credible information” that a splinter group of the Islamic State has been ordered to kidnap journalists in the Mideast and take them to Syria. I am not surprised by this news. It is, after all, a well-known tactic of Islamist terrorists to kidnap and murder journalists. Beyond the obvious political reasons for kidnapping and murdering journalists is another less apparent motive. Journalists, especially those from nations with a free press, disseminate information and there is nothing Islamic fundamentalists and terrorists hate more than free-flowing information. With information comes knowledge and the last thing religious fanatics like the Islamic State want is an informed and educated people who can actually think for themselves. In its rare intelligence bulletin to news organizations the FBI warned that the group will attempt to hide its affiliation with the Islamic State in order to gain access to unsuspecting correspondents, cameramen and photographers. The Islamic State has already beheaded two American journalists, James Foley and Steven Sotloff, and two British aid workers. The group is believed to be holding a several other Western hostages. 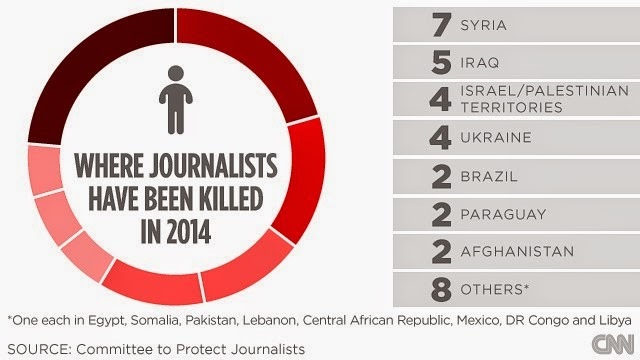 The Committee to Protect Journalists reports that more than 70 journalists already have been killed covering the Syrian conflict since it began in March 2011. Instead their reporters file reports from Turkey and Lebanon and rely on secondary sources inside Syria. They also interview refugees and aid workers and monitor social media in the region. In light of the recent beheadings and the obvious danger of covering the civil war in Syria and brutal behavior of the Islamic State in Iraq, several American news organizations have stopped sending journalists to the region. As someone who once covered wars and revolutions from Asia to Latin America I can’t imagine trying to cover a conflict without actually being on the ground where the fighting is taking place. The closest I ever came to such a situation was the brief Falklands/Malvinas war between Great Britain and Argentina in 1982. Several hundred journalists (me included) were not allowed by Argentina to travel to the Falkland/Malvinas Islands. Instead, we had to cover the war from Buenos Aires and the Sheraton Hotel, where the Argentine authorities had set up a press room (AKA “Rubber Room”) on the third floor. There, we received government handouts that provided highly sanitized military reports on how the war was going. While it was the safest I had ever been while covering a war, it was also the most frustrating experience of my career as a war correspondent. After an evening of consuming too much Argentine beer and wine eight of us correspondents decided to charter a fishing boat to take us to the islands. We actually found someone willing to do it for $5,000, but at the last minute the boat’s captain refused to go, saying he had been warned that if he tried the Argentine Navy would sink his boat with all hands. Looking back on it, I think I would rather have taken my chances of surviving an attack by the Argentine Navy than reporting the story from Syria today. Covering war is dangerous work. As a noncombatant you risk being shot, shredded by shrapnel, or blown up by a mine or improvised explosive device. But covering war AND shielding yourself from fanatics like those in the Islamic State is asking a lot of reporters and photographers. Sadly, many of the journalists who are putting themselves in harm’s way today in Syria, Iraq and Afghanistan are freelancers. For freelancers covering war has always been the fast track to establish their journalistic chops and work their way into a professional news organization. Reputations are made this way. My advice to those who feel they MUST race off to places like Syria, Iraq and Afghanistan: Make haste slowly. Life is already short. And I have yet to find a story that was worth more than my life, insignificant as it may be.